Outdoor kitchens and cooking areas are a great addition to any backyard patio or landscape. They bring enjoyment and convenience into your backyard and they also add a touch class to an otherwise boring landscape. Outdoor kitchens can incorporate concrete patios, outdoor fire pits, and BBQ areas, rock walls and even “seat walls” that not only add separation to your property but function as a durable seating option as well. What Type Of Outdoor Living Space Are You Day Dreaming About? A beautiful patio surrounded by garden beds and planters. 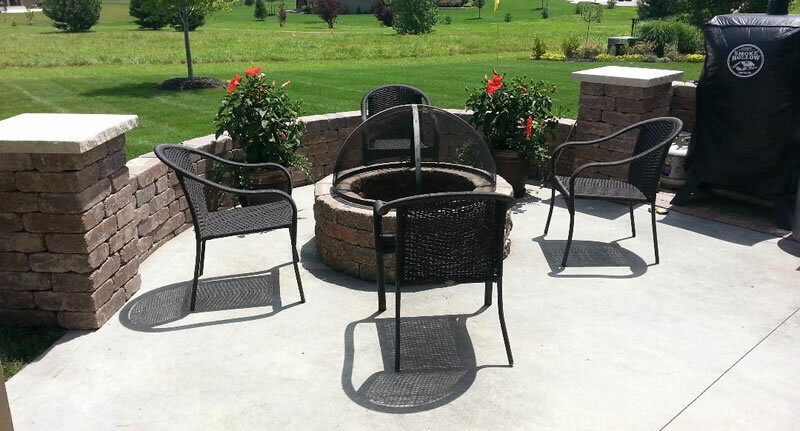 An outdoor firepit to enjoy those summer evenings. An outdoor kitchen for entertaining guests. A pool deck or patio area surrounding a hot tub. A patio with a pergola or gazebo. Green Acres Lawn & Landscape is a licensed and insured landscaping company serving the Kansas City metro area. We specialize in the design and construction of outdoor living spaces, outdoor cooking areas, outdoor kitchens, pool decks, hot tub decks, and fire pits. Instead of being the indoor chef at your next get together and away from all the fun and social activity you can now be the center of all the action with a beautiful new outdoor kitchen or outdoor living space. There are many things for you to consider when you’re building an outdoor cooking area and one of the most important is access to utilities. Depending on how elaborate your outdoor living space dreams are you will may require the services of a licensed plumber to bring gas to your BBQ or fireplace and you also may need an electrician to make sure you have sufficient electricity to safely run any outdoor appliances, music, or outdoor lighting you choose to incorporate. Depending on your property and where you’d like to build your outdoor kitchen or cooking area there will be property grading required so you don’t run into drainage problems down the road. This becomes especially important if the new outdoor living space will join up to existing landscaping features such as a pool deck, walkway or an existing patio. If you plan to have a covered cooking area then we’ll need to plan ahead for the footings in the foundation to accept whatever type of structure you’d like to have built such as a gazebo or a pergola. There are no limits to your outdoor living space when you’re working with a talented landscaping company, we can help you maximize your value and get the best outdoor living space you possibly can for your budget. If you’d like to schedule an estimate to build the outdoor kitchen or outdoor living space you’ve envisioned then just give us a call (913) 422-5111 or fill out our contact form and we’ll get right back to you.